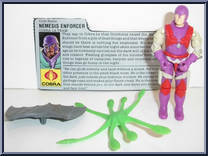 They say in Cobra-La that Golobulus raised the Nemesis Enforcer from a pile of dead things and that where his soul should be there is nothing but emptiness. His leathern wings have beat across the night skies since before the ice age as he tirelessly carried out the dark will of his master and creator. Fleeting glimpses of his sinister form gave rise to legends of vampires, harpies, and countless other things that go bump in the night . . .
"He can glide silently and land without a sound. He is the other presence in the pitch-black room. He is the lurker in the dark, just outside your bedroom window. He rattles the garbage cans and makes your floors creak. He is the dread that stands behind you in the dark and dares you to turn and face him!" Contribute pictures, update details or suggest corrections for Nemesis Enforcer. Write a review about Nemesis Enforcer.